Thu., Oct. 26, 2017, 9:56 p.m.
Keller Chryst threw a 3-yard touchdown pass to JJ Arcega-Whiteside with 20 seconds left and No. 20 Stanford scored a 15-14 come-from-behind victory over Oregon State on Thursday night. Stanford (6-2, 5-1 Pac-12) went for it on fourth-and-10 on the Oregon State 40 with 2:19 left in the game and Chryst hit Kaden Smith with a 25-yard pass to keep the drive alive. After Chryst found Arcega-Whiteside in the end zone, the 2-point conversion failed but Stanford intercepted Oregon State quarterback Darell Garretson’s hurl with 3 seconds left to end it. The Beavers (1-7, 0-5) were playing the second game since the school parted ways with head coach Gary Andersen. Interim coach Cory Hall had been the cornerbacks coach. After the defenses dominated the first quarter, Stanford opened the scoring with Jet Toner’s 40-yard field goal. On Oregon State’s ensuing drive, Garretson’s keeper put the Beavers up 7-3. Stanford recovered Garretson’s fumble at the Oregon State 16 but wasn’t able to get closer and settled for a Toner’s 33-yard field goal to head into halftime down 7-6. 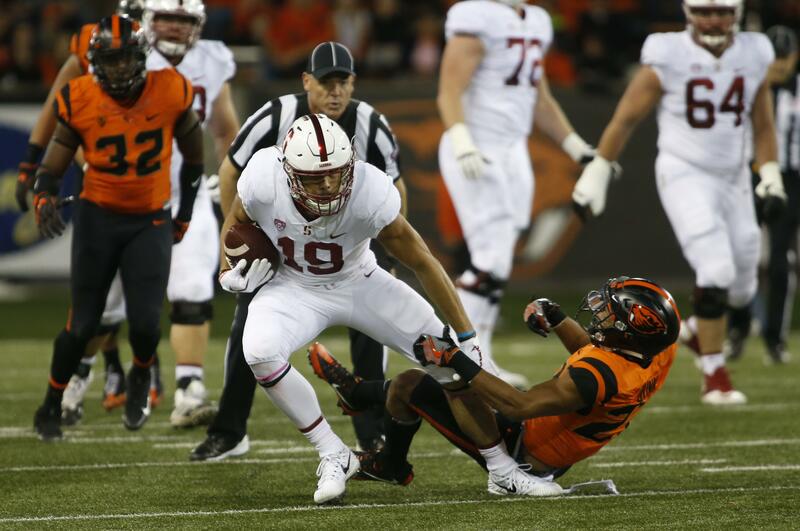 Stanford was flagged for roughing Garretson on the Beavers’ first series of the second half. On the same play, Cardinal cornerback Alijah Holder left the game with an apparent knee injury and inside linebacker Joey Alfieri was ejected from the game for targeting. The Beavers went on to cap the drive with Thomas Tyner’s touchdown run to go up 14-6. Stanford running back and Heisman Trophy hopeful Bryce Love did not play in the Cardinals’ win over Oregon State. Love, the nation’s top running back with an average of 198.1 yards rushing per game, tweaked an ankle against Oregon on Oct. 14. A midseason AP All-American, Love has 1,387 total yards this season and is averaging 10.27 yards per carry, both also national bests. Seven suspended Florida players, including standout receiver Antonio Callaway, are entering a pretrial intervention program that could result in the dismissal of felony credit card fraud charges. State Attorney Bill Cervone filed paperwork with the Alachua County court Thursday that showed the outcome of a monthlong investigation. The players will need to make restitution and comply with probation protocols over the next 12 months to get the charges dropped without any legal findings. The intervention agreements still need to be approved by a judge in the coming weeks. Callaway, running back Jordan Scarlett, defensive lineman Keivonnis Davis, defensive lineman Richerd Desir-Jones, linebacker James Houston, linebacker Ventrell Miller and receiver Rick Wells were charged with fraudulent use of a credit card and identity theft. Each of them made one charge with a stolen credit card number, ranging in value from $500 to $2,000, authorities said. No one should expect the seven players back on the field anytime soon. They still have to go before the university’s Student Code of Conduct Committee to determine potential punishment before even returning to practice. Published: Oct. 26, 2017, 9:56 p.m.